Donald Trump has described Joint Comprehensive Plan of Action as the ‘worst deal ever’. 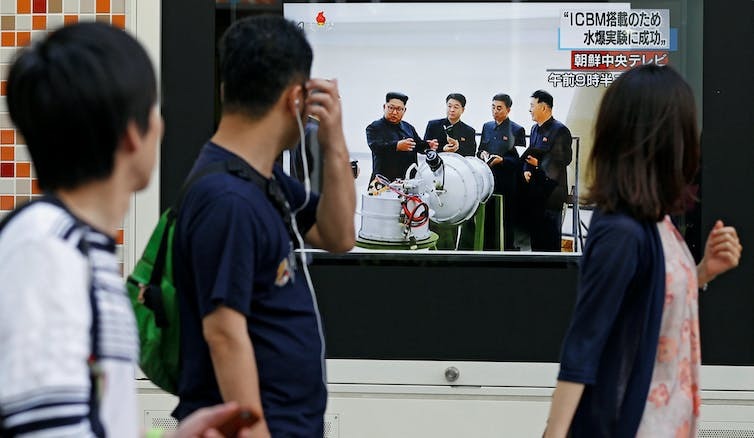 While North Korea’s reckless behaviour in pursuit of a nuclear weapons program has diverted international attention in recent weeks, another crisis-in-the-making should be regarded with equal concern. What the world does not need right now is another nuclear crisis on top of efforts to build a global consensus to deal with North Korean brinkmanship. And yet that is what is at risk from a policy tug-of-war in the Trump administration between those who believe Iran is living up to its obligations – however imperfectly – under a 2015 agreement to freeze its nuclear program and those who want to toughen its provisions. 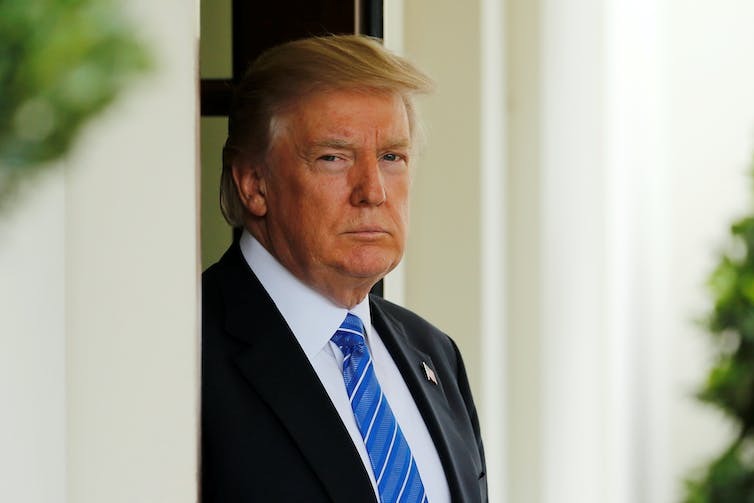 US President Donald Trump has described the agreement, known as the Joint Comprehensive Plan of Action (JCPOA) – a centrepiece of his predecessor’s foreign policy – as the “worst deal ever”. Under a Congressional mandate, the administration is obliged to certify the agreement every 90 days. On the advice of Secretary of State Rex Tillerson, Trump has done this twice, but a festering issue has bubbled to the surface ahead of the next certification deadline on October 15. Administration hawks are pushing for a renegotiation of the original agreement – something that Iran would almost certainly resist, along with other parties to the deal. These include, apart from the US, the remaining four permanent members of the UN Security Council plus Germany. 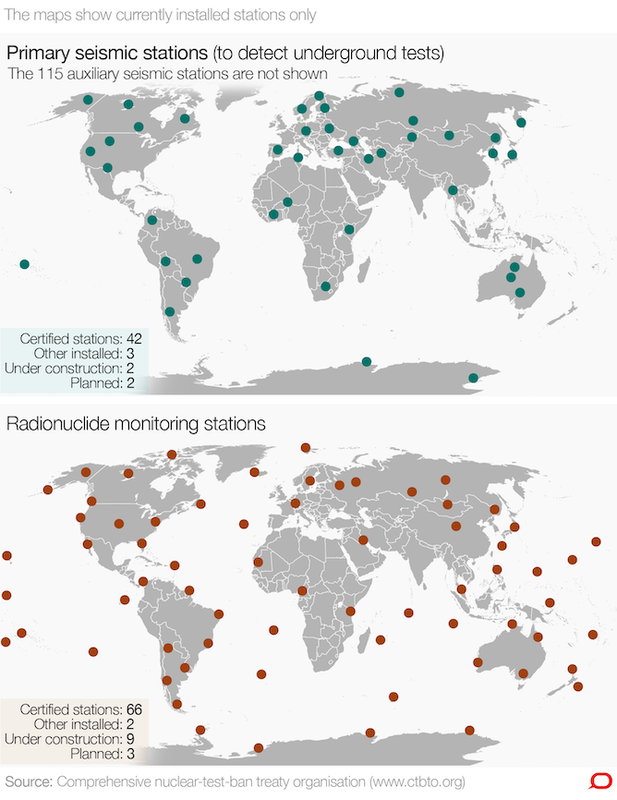 China and Russia could be expected to be especially resistant. Any US action to withhold certification or seek to alter the terms of the JCPOA risks prompting an international crisis in which the US would find itself isolated from its natural allies. And all this at a moment when global consensus is required to deal with North Korea. Gulf states, led by Saudi Arabia, might be pressuring the US to toughen its stance against Iran more generally, but if the JCPOA became a casualty of these pressures, an even more chaotic Middle East would be a likely result. Israel’s campaign againstthe JCPOA has been relentless, and in this it finds itself aligned with Saudi Arabia in ways that have the potential to shift regional alignments. In the Arab vernacular: “the enemy of my enemy is my friend”. In the US, concern about the administration’s commitment to the JCPOA has stirred arms control experts to counsel against steps that would jeopardise an agreement, however flawed, that appears to be working. Thomas Countryman, who served as assistant secretary of state for international security and nonproliferation from 2011 to 2017 (during which the JCPOA was negotiated), warned this week of risks to the agreement. The president campaigned on rash promises, including plans to tear up the deal, and he made it clear this summer that he still expects to pull out of the “worst deal ever”. Sadly, he may do so even without any evidence to justify such an extreme course of action. 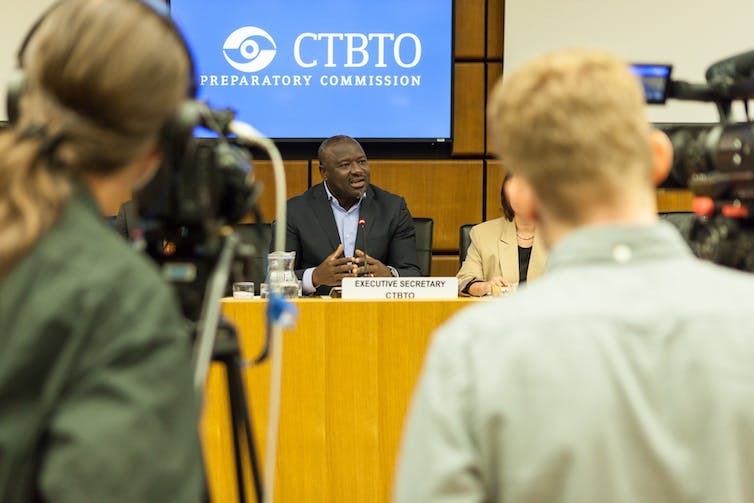 Countryman noted that just last week the International Atomic Energy Agency had reported that all parties to the JCPOA – including Iran – are in “full compliance” with the agreement. This is the eighth time the agency, in its regular reports mandated by the JCPOA, has confirmed that the nuclear deal is working. This expert assessment is not being challenged directly by members of the administration antipathetic to the agreement, but an attempt appears to be underway to reinterpret the JCPOA to take into account Iran’s behaviour more broadly. Judging any international agreement begins and ends with the nature of the government that signed it. Does it respect international law? Can it be trusted to abide by its commitments? Is the agreement in the national interests of the United States. Haley answered her own question by launching an ad-hominem attack on Iran more generally, including criticism of its continuing development of a ballistic missile capability. The ballistic missile issue is not dealt with in the JCPOA, rather in a separate UN resolution. Under the law, if there was such a referral Congress has 60 days to consider whether to reimpose sanctions on Iran. During that time, Congress could take the opportunity to debate Iran’s support for terrorism, its past nuclear activity and its massive human-right violations. This process would almost certainly destabilise the JCPOA. If Mr Trump blows up the nuclear deal, then what? None of the original opponents of the deal, in or out of Congress, including Mr Trump, have offered any plausible alternative for restraining Iran’s nuclear ambitions. Without such an alternative, a reckless decision to honour a reckless campaign promise invites Iran to pursue an unfettered path to a bomb. And if deals with the United States cannot be trusted, North Korea will have one more reason to keep pursuing its nuclear program. In all of this one might have sympathy for Tillerson, who has been tasked with seeking to toughen provision of the JCPOA in consultation with America’s allies. Tillerson is reportedly arguing for an extension of the freeze on Iran’s nuclear enrichment program beyond the 2025 and 2030 limits specified in the agreement. 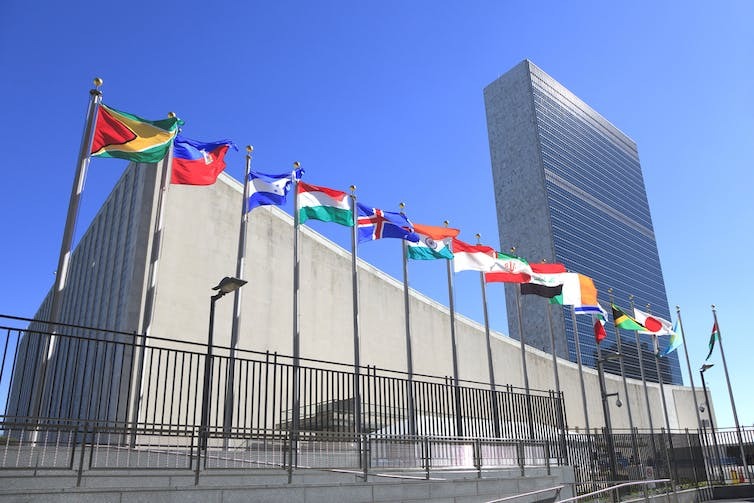 Those discussions will continue on the sidelines of the UN General Assembly in New York next week when foreign ministers of the JCPOA signatories have been asked to convene to discuss the issue. Indications are that the US will have some difficulty persuading the representatives of China, Russia, the UK, France and Germany to revisit the JCPOA. One option being canvassed by the US is for a separate set of agreements that would seek both to limit Iran’s missile development, and extend the “sunset” provisions on its nuclear enrichment program. New French president Emmanuel Macron has expressed lukewarm support, but it seems unlikely Germany’s Angela Merkel would fall into line if such a step risked the overall agreement struck after two years of painstaking negotiations. I could imagine such a format being used to end the North Korea conflict. Europe and especially Germany should be prepared to play a very active part in that. 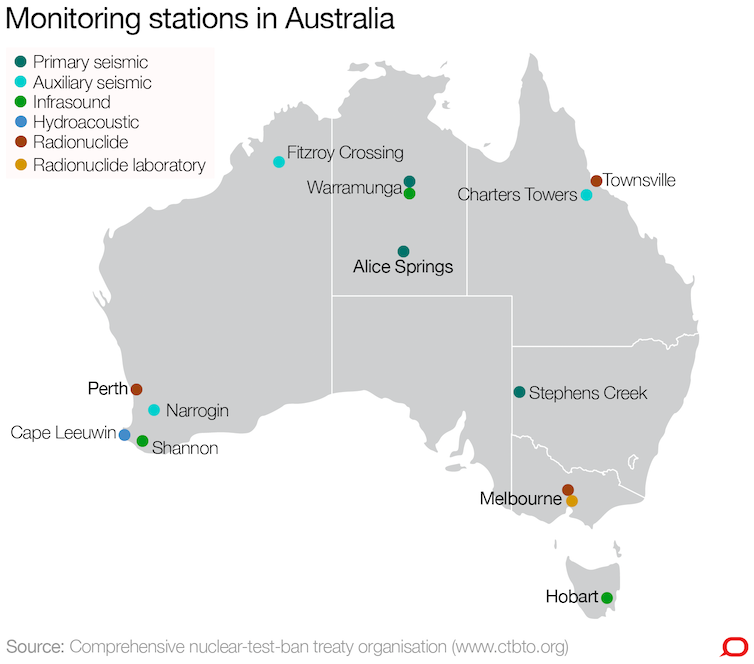 From an Australian perspective, no purpose would be served at a moment when it wants the focus to remain on North Korea by a separate crisis over Iran’s nuclear ambitions. Australia might be “joined at the hip” to the US, in Prime Minister Malcolm Turnbull’s words, but when it comes to an issue like America’s threats to blow up the JCPOA, Australia would be advised to endure a bit of separation anxiety. 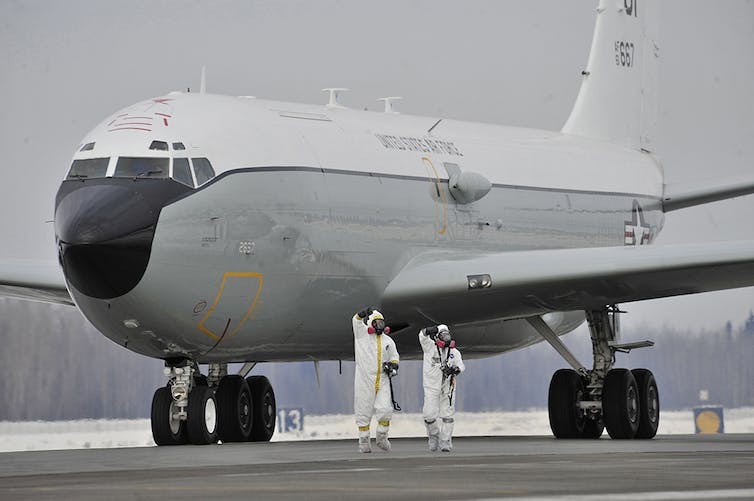 Boeing WC-135 Constant Phoenix “sniffer plane” used to monitor radioactive emissions from nuclear bomb tests. 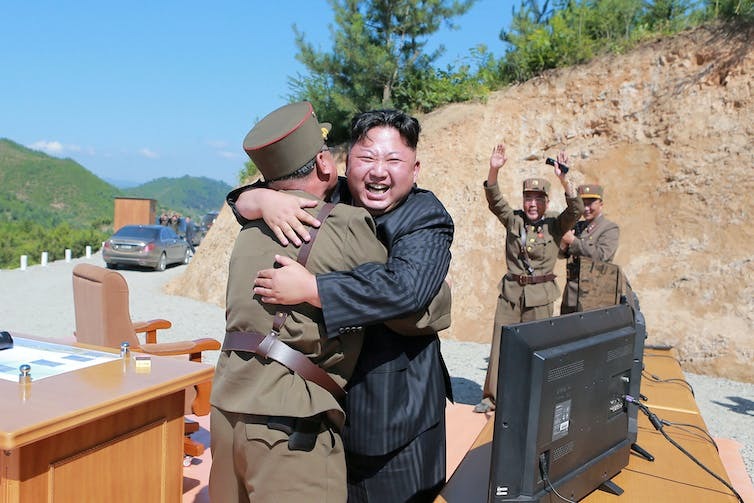 On Sunday, North Korea claimed it had completed its sixth nuclear test – a hydrogen bomb. 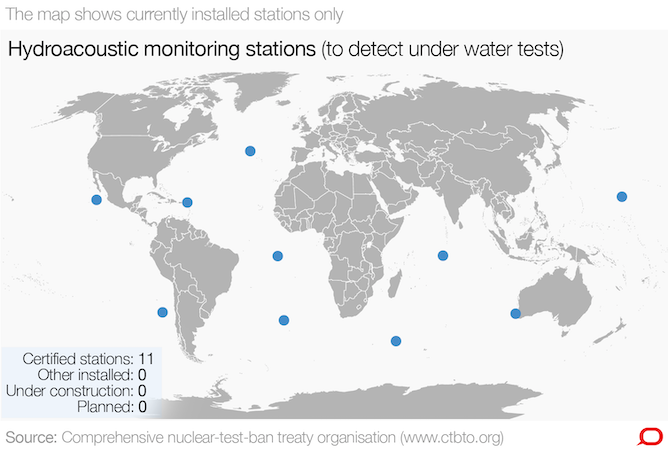 This test was performed underground by the notoriously secretive regime. So, how can the international community know the state news agency was telling the truth? The 6.3 magnitude tremor tells us there was an explosion Sunday. But to know this was a nuclear test, we have to detect the signature of a nuclear explosion. Nuclear weapons either produce energy through nuclear fission (fission bombs) or a combination of fission and fusion (thermonuclear or hydrogen bombs). In both cases, nuclear reactions with neutrons cause the uranium or plutonium fuel to fission into two smaller nuclei, called fission fragments. These fragments are radioactive, and can be detected by their characteristic decay radiation. If we detect these fission fragments, we know that a nuclear explosion occurred. And that’s where “sniffer” planes come in. A WC-135 Constant Phoenix from the 45th Reconnaissance Squadron taxis in on the flightline. What can fission fragments tell us? Something happened during this test that has people excited — there was an additional magnitude 4.1 tremor around eight minutes after the initial tremor, according to the United States Geological Survey. Among other things, this may indicate that the tunnel containing the bomb collapsed. If this happened, then other fission products and other radioactive isotopes could escape as dust particles. This might have been accidental or deliberate (to provide proof to international viewers), but in either case, we may learn a lot, depending on how fast the sniffer planes arrived and how much dust was released. For example, by looking at the probability of seeing fission fragments with different masses, the composition of the fission fuel could be determined. We could also learn about the composition of the rest of the bomb. These facts are things that nuclear states keep very secret. Crucially, by looking for isotopes that could only be produced in a high intensity high energy neutron flux, we could suggest whether or not the bomb was indeed a hydrogen bomb. What can’t they tell us? 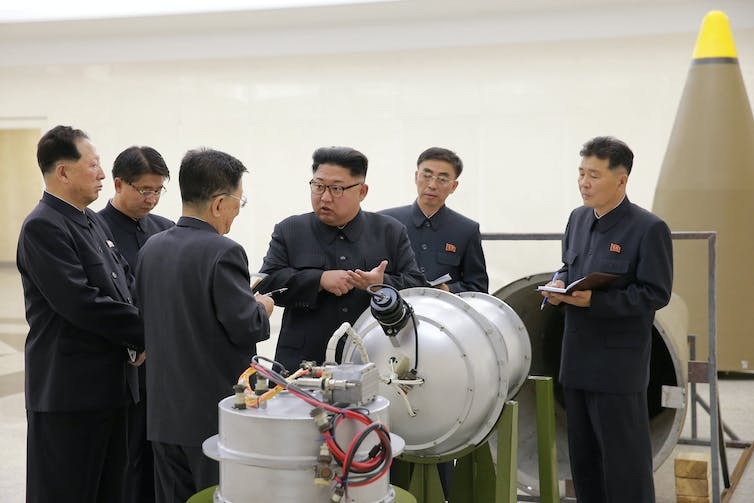 Whether or not North Korea has a thermonuclear device that is capable of being mounted to an ICBM is a question weighing heavily on the minds of the international community. 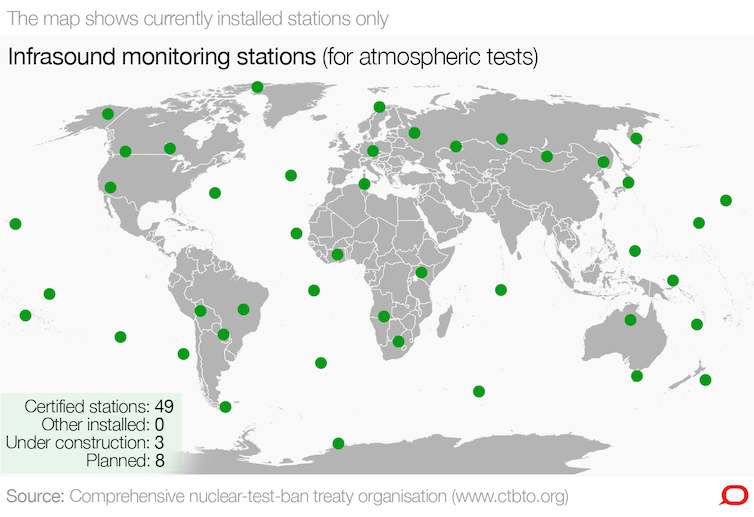 Sniffer planes and the CTBTO network will be wringing all of the data they can out of the debris in the atmosphere to help the world understand the nuclear threat from North Korea.